To achieve this, the mutual interactions of crop plants with weeds and co-cultivated plants, with soil macro- and micro-organisms in their physically and chemically determined environment influencing C and N pools and fluxes as well as greenhouse gas (GHG) emissions will be studied. Top soil layers with increased fertility supporting crop growth may result from reduced soil tillage, increased inputs of organic matter, green manures, and animal manures, and often they are found in orchards and vineyards that are tilled only superficially.Work is carried out in 7 work packages. Twenty field experiments along a South West to North East transect across Europe on fertility inputs such as green manure (10) and animal manure (7), on soil tillage (7) and crop rotations (7), and on whole farming systems (5) provide historical data on crop and soil performance built into a database. The FertilCrop project is funded by the CORE Organic Plus Funding Bodies being partners of the FP7 ERA-Net project, CORE Organic Plus (www.coreorganic.org). Existing field trials on reduced soil tillage, green manures and other fertility inputs and the comparison of organic and conventional farming practice are used for the aims of the work packages. Archived data, soil samples, and new data collections are shared for specific analyses and modelling. The coordination comprises organizing of meetings, Skype discussions, collecting and editing of inputs for the reports, as well as representing the project to CORE Organic Plus. It also involves the dissemination of project outcomes, including a project webpage, a project flyer, publications to the farmer press and media, whereas scientific publications come out of the interactive work packages. The weed work package is collecting data from field trial owners to analyse weed suppression by improved conservation agriculture practices. The interaction of weed pressure and crop yield is analysed in relation to soil characteristics. Interactions of crops and weeds are investigated by new experiments where physical, chemical and biological soil characteristics are modified. Ecosystem services provided by weeds in organic farming systems are investigated and data on functional traits of weed species are collected in a database that was developed in TILMAN‐ORG. The interaction of soil structure and the soil dwelling macro‐ and meso‐fauna are investigated in reduced tillage systems particularly, because of the clear stratification. Techniques for visual soil assessment are developed and applied and will be compared to scientific data obtained on the same sites. Farmers find the spade diagnosis the most appropriate soil test; however, they mainly use it to determine the soil’s suitability for tillage. Expert input for visual soil assessment comes from Bruce Ball (SRUC) and synergies to the projects iSQAPER (Horizon 2020), OK‐Net Arable (Horizon 2020), and other national projects are used for testing and disseminating soil tests to soil users. Thomas Alföldi of FiBL produced a video on spade diagnosis. A technical note on the spade diagnosis based on the VESS approach of Bruce Ball will be finalized in the next months. Soil microorganisms are the main drivers of soil nutrient cycles and they indicate changes in soil characteristics earlier than chemical soil analyses, such as soil organic matter. They also react to changes in the management and they accumulate in the top layers of no‐till and reduced tillage soils, unlike ploughed soils where they are distributed over the whole Ap horizon. We are evaluating the role of soil stratification for the quality and fertility of soils by comparing soil biological data in soil strata with soil functions. Teabags will be used as mini‐litter bags to follow the soil function decomposition. A technical note on this is available. 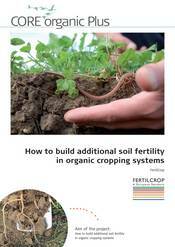 The dynamics of nitrogen and carbon in the view of building soil fertility are reviewed focussing on leguminous crops in organic crop rotations. A technical note on legumes and nodule formation as an indicator for N‐fixing capacity is published soon. The risk of fertility building measures to enhance the emission of the greenhouse gas N2O will be evaluated and this is planned for a scientific publication. Crop growth and C‐ and N‐dynamics are simulated with whole‐farm dynamic model Fasset, and compared to datasets from many of the FertilCrop field trials. The simulations with crop data were successful and in line with the measurements while they were less reliable with soil nitrogen dynamics. Changes in fertility management will be subject of another modelling exercise targeting at long‐term effects on a time horizon of 20‐30 years. The strategic management tool “HighCrop” – successfully used in Denmark – has been translated from Danish into English and will be promoted by a technical note. Soil and crop indicators are evaluated as a whole and conceptual models are used to assemble and aggregate indicators for a synopsis of management strategies to improve soil fertility. The participatory design of management strategies that build soil fertility is based on prototyping exercises with experts and will be tested with farmers. Source: The text is from the FertilCrop Midterm report submitted July 2016.